The ninth Towards Carfree Cities conference took place in the historic city of York, England, from Monday 28 June to Thursday 1 July 2010. Presentations from the conference are now available online in .pdf format on the Full Programme page. The general focus of the conference is on strategy, collaboration and exchange, assisting the practical work of conference participants, from organising carfree days to planning the carfree cities of the future. This year's conference, "How Do We Get There? ", concentrated on bringing carfree communities to life, considering a range of strategies from temporary events to permanent road space reallocation to European models of new carfree development. We organised a real street closure during the conference! 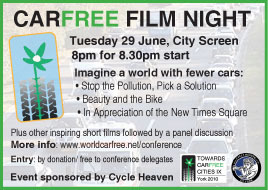 The conference, hosted by Carfree UK and its local partners, was held within the walls of medieval York at the Priory Street Centre, a short walk from the railway station. Download the conference flyer (PDF document). At its heart is a medieval walled city with rich history dating back to Roman times. 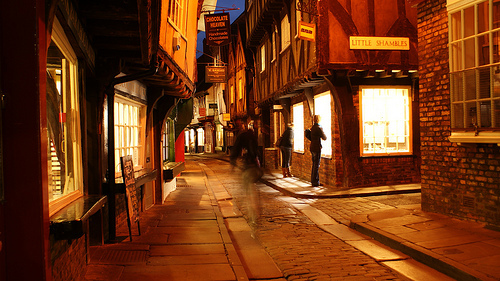 Much of it is remarkably well preserved, maintaining its character in one of Europe's largest pedestrianised areas, now known as York's 'footstreets' network. York is one of the UK's premier cycling cities, and has recently won a major grant as a Cycling City, to improve facilities for cyclists and get more people cycling. York is also a major rail hub, and home to the National Railway Museum, the world�s largest railway museum. The York Cycle Show took place on the weekend of 19-20 June. The Cycle Show website has plenty of local links including travel, accommodation and cycle hire. 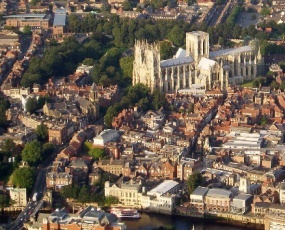 For more about York, see Wikipedia, Visit York and History of York. Please see our Programme Summary and Full Programme pages for more information on conference activities - links to individual presentations will be added over the next month or so. We have a Facebook group devoted to the conference, where participants can continue to communicate with each other.